Larina is an Imperial in Hob's Fall Cave. She is imprisoned in a cage on the ledge in the first room you enter. 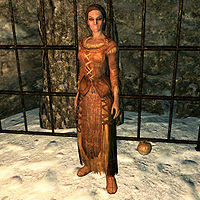 Pantea Ateia mentions she is a student at the Bards College in Solitude, who sold Pantea's Flute to the necromancers in the cave she appears in. You can hear her yell "You have to help me, they are going to kill me! ", and when you leave the room as you must to continue the dungeon, she will yell "You can't just leave me here!" However, you cannot actually save her. Once you reach a certain point in the dungeon, she will be killed and placed on a table and necromancers will spawn around her. She wears a pair of boots and clothes. The RefID of the dead version of her is 0008019C. You can climb up the ledge and free her at the beginning of the dungeon by walking and jumping creatively near the big round rock to the right. However, she will have no unique dialogue and the necromancers will not be there. 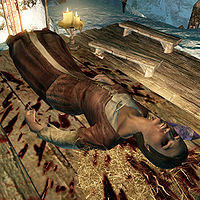 If you manage to climb up the wall and attack her, your bounty in the Rift increases because she is in the faction CrimeFactionRift, even though the cave is in Winterhold. This page was last modified on 25 June 2018, at 03:07.